Porter County first enacted a county option income tax in 2002, following the Bethlehem Steel bankruptcy and the fiscal crisis that resulted for local government units. 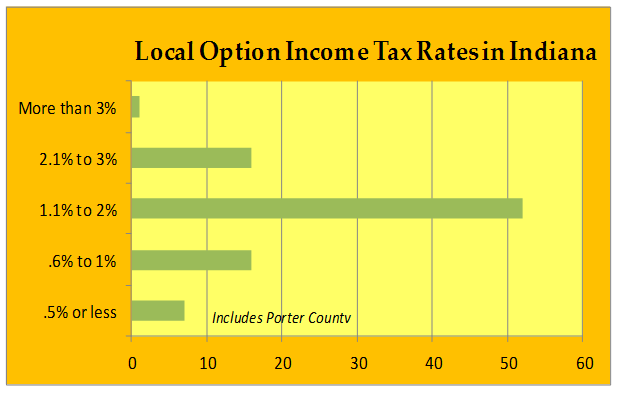 The Indiana Legislature offered Porter County taxing units a no-interest "bail out" loan, under the condition that Porter County adopt a county option income tax. The County Economic Development Income Tax (CEDIT) was then established at a rate of .0025 (.25%). In 2005, Porter County amended the CEDIT rate after Indiana lawmakers established the Northwest Indiana Regional Development Authority (RDA). State legislation allowed Porter County to pay its $3.5 million dues to the RDA with a new income tax that would also include property tax relief for homeowners. Effective July 1, 2005, the CEDIT rate was set at .005 (.5%). A bill that passed the Indiana Legislature in 2015, H.B. 1485, restructured the county option income tax laws. The tax is now known as the "Local Income Tax," or LIT, with different rate components and uses of the revenue. The transition took effect in 2017. All Indiana counties have adopted a county income tax, and Porter County's rate of .5% is among the lowest. As shown in the chart below, most Indiana county income tax rates are in the range of 1.1% to 2%. Source: State Budget Agency. Data reflect rate changes for 2016.